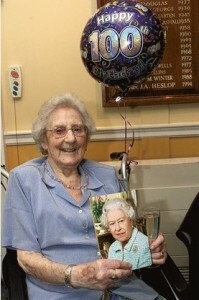 Mrs Simpson, who moved to the college in its centenary year of November 1995, celebrated her own centenary there in June this year with a tea party for family, friends and fellow residents. They all enjoyed a glass of champagne and cake made by Mary Nagel, daughter of Mrs Sally Thomas, a long time friend of Mrs Simpson, who sadly died in March this year. In addition there was a ‘cake’ covered with 100 candles carved by her Canadian son-in-law from a Juniper tree, which he carried from B.C via Spain and Portugal to the College. Her first marriage to clergyman Fr Edgar Saunders left her a widow in 1960, when she was not only grief-stricken by widowhood, but threatened with homelessness and financial hardship. Clergy wives more than 50 years ago seldom worked, and having lost her husband she also had to leave their Gloucestershire vicarage, when she discovered that somehow her husband had managed to save £2,000 – which was enough to buy her a modest home. To secure her own financial future and that of her teenage son, Mrs Simpson went on to train as a social worker, and it was while involved with placing a baby for adoption that she met her second husband, Fr Clarence Simpson. The couple married the following year and Mrs Simpson found herself with three step children in addition to her son David and daughter Biddy. In 1995 the Simpsons made the decision to retire to the clergy home in Dormansland, but Fr Clarence died just 18 months later.